КАК ПРОЙТИ МАЙНКРАФТ ЗА 4 МИНУТЫ?!? РЕКОРД МИРА. Как пройти игру? Если не ошибаюсь, то здесь нужно написать немного о себе. Ну что-же? Давайте начнем! Меня зовут - Юра мой ник \"Nerkin_\", мне 18 лет, очень люблю снимать Майнкрафт. 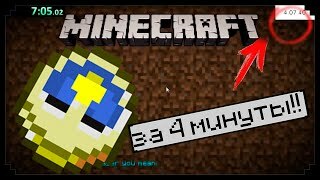 Также я люблю делать переводы на русский язык minecraft анимации. Делаю свои небольшие Minecraft Machinima, и иногда обозреваю глобальные и интересные моды.Делаю также топы в майнкрафте, интересные факты, декорации в майнкрафте, а также делаю видео по Майнкрафт Покет Эдишн. Если тебе нравиться интересный монтаж видео, приятный дизайн и хорошее качество видео то жми тут сверху слева кнопку \"Подписаться\" и также на забудь следить за мной в разных соц. сетях (Вконтакте,Твиттер,Инстаграм). Вам обязательно понравиться моё творчество! Hello mine friends My name is Nerkin And Let me tell you something How do you think, how fast can you go through minecraft what do you think ? Your answer options I'll wait a couple of seconds and not necessary And how to invent? What is the absolute record of the minecraft passing through everything, from the beginning of the creation of the map, to the end of the killing of the dragon. And just Transition to your normal world I believe that it took a very long time It took me about 5 hours. What do you think is speed run? I think that not many know what speed run This is the passage of a quick game in any order What do you think is the fastest record The fastest record is ... This is a world record that was confirmed by moyang. Time 4 minutes 7 seconds. Do you think it's fast or not fast? I think it's very fast! And today I'll show you this video, and we'll see how this guy did it. His name is Josh game 4 and he made an absolute record for maynecraft. Okay friends, let's see how he did it. Okay friends, and we started and see how you understood it he did it very, very, often and very long, he was preparing for this, because he was doing everything here, he used bugs, glitches, he used a special cheat, this You can do it by the rules. He respawned in the village, and he runs to the house where he already breaks it, there is a trunk in which lies all that he needs for its construction,. And this is obsidian, iron, gold..
And as you can see, he is copying everything, he knows everything, everything is able, everything does It's very easy and simple And it seems to me that he did it very, very long. There is also a timer on the left and on the right The timer on the left is the timer that counts the entire process. The timer on the right shows how much time it is in the game. Here he has already come and has created a crafting table Friends, he does it very quickly! Quickly he received a golden apple, a golden shovel, a golden pickaxe. And he begins to trade with a resident. He makes himself a lighter, and again he copies everything. It turns out, and it breaks the minecraft. Great, and he goes ... I do not know how this could all come up, but it's very, very fast He again comes into his world and he begins to copy everything again. I do not even know how this could all be done, because he had passed so many times that ... I do not know)). Has already passed 1:54 otlchino! In the game he spent only 50 seconds. And he continues to copy all his things. I do not know what these things are for, because I'm watching this video with you. He passes very, very quickly into his world and he begins to haggle. Oh. Why did he need a red key? I do not know)) but for what it is he took it. Okay, what does he do? He again copies everything. Yes you can say that it is very dishonest, but you can go through the mnecraft in different ways. If all these bugs, glitches are present in the minecraft, then WHY AND NOT)). It's very easy and simple to do, because they were not removed by the developers of the game, then why not. It seems to me that it can be used, because it's very easy and simple. If I were to run such a speed, I would use these possibilities). Okay, you see that he is copying all this again. He already plays 3 minutes, and in the game 1:49 seconds. He takes wooden blocks ... he makes a bed And for what these beds, you will soon find out. He makes golden apples. He made the golden apples. EXCELLENT! And he does not pick up the rest of the apples!. Excellent . He again begins to copy it, selects them and he breaks the minecraft. Okay, okay, okay ahaha. He takes a bow and 64 arrows. And he starts already doing a portal to hell, eating a golden apple and going to hell. And look how fast he jumps! Incredibly fast prigaet! And incredibly fast runs somewhere. Because he knows where to put another portal one portal to hell.. Here he is building a portal to hell, because he will come right now to the fortress, where he can go to the world of a dragon. He immediately spawned in the fortress. And boom. He goes to the dragon! Just 2 minutes and 30 seconds passed, and you see, he is already climbing quickly ... everything .. all passed 5 minutes ... and he starts shooting at the dragon. And see what he does ... he takes the bed and block! Boom !!... See how quickly he does it! It's all easy and simple guys! I did not know that this way you can kill a dragon! But you see, he goes on firing at him. And what does he do next? And what does he do next? Okay, he waits for a dragon to come to him, puts a bed and an absidian, so that he does not get hit by an explosion. FUNNY! He does it really fast guys! 3 minutes in the game passed!. And here to him the dragon flies again and the bed explodes Unnecessary. And here again to it the dragon and a boom flies! It explodes! I wonder how many lives the dragon has left?. This is very small. And so he again waits for him ... And see .. all .. boom !!!! It explodes all . He passed the game friends!. 3 minutes 47 seconds ... the timer is updated and that's it. 4 minutes and 7 seconds. He passed the game!. And in total 6 minutes and 50 seconds have passed.